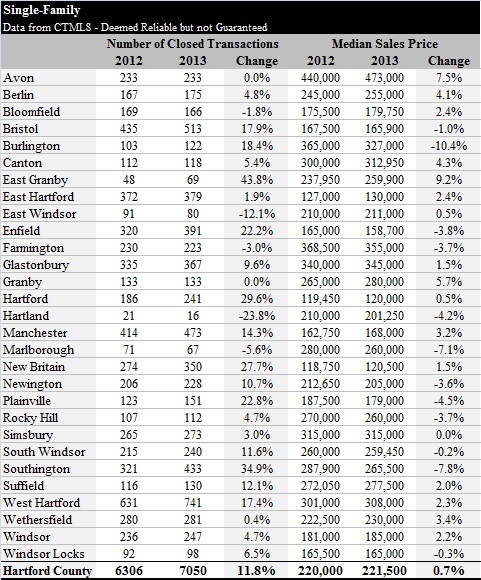 Last week we gave an overview of the 2011 City of Hartford revaluation. Here’s the revaluation schedule for the rest of the towns in the County. The process is basically the same everywhere. Towns review all the properties to make sure they have the correct stats – beds, baths, size, etc. Next they gather information on sales and feed all the data into the computer. A value is assigned to each property and the owners are notified – generally in the fall of the revaluation year. West Hartford has an FAQ document on the part of their website related to the 2011 revaluation. Here is their answer to one important question that homeowners often have. While property improvements generally increase the value to your property, they may or may not change the assessment to your property. For example, while replacing a roof covering, a furnace, a water heater or updating your electrical main should have a positive effect on your market value they are not likely to increase your assessment. Landscaping your property should increase its curb appeal and could also increase its value, but would not increase your assessment. There are also improvements that would increase your market value and correspondingly your assessment. Some of these changes include adding central air conditioning, finishing off a basement, building an addition, and possibly remodeling a kitchen or bath(s). Even after property owners receive their initial letter, they have an opportunity to challenge the new valuation. It usually begins with an informal hearing, which is basically just a meeting in which the owner can present their case. We always advise bringing data to support your argument. If the informal hearing doesn’t produce the desired outcome, then there is a more formal appeals process. This can vary by town, so be sure to check with your assessor to find out the exact process.